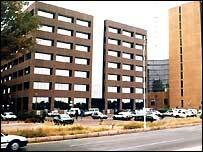 BBC NEWS | Africa | Botswana: Africa's success story? Gaborone is certainly not your typical African capital. Forty years ago, just before Botswana's independence, there was barely anything here at all. Now though, the skyline is dotted with high-rise buildings, and new shopping malls. In many ways, it is a featureless place, but rush-hour traffic jams have become the norm as the city expands. Botswana is certainly different to most other African countries. Since independence in 1966, it has been politically stable, with a multiparty democracy. The country has enjoyed four decades of economic growth, underpinned by its diamond industry; and is the largest producer of diamonds - by value - in the world. But the Botswana government is concerned that as a success story by African standards, it may be ignored when UK Prime Minister Tony Blair's Commission for Africa publishes its action plan for helping the world's poorest continent later this week. At the offices of the Debswana Diamond Company, owned jointly by the Botswana government and De Beers, Managing Director Blackie Marole explains that Botswana was a poor country at the time of independence. The mining of diamonds made all the difference, although he acknowledges that now, Botswana needs to end its over-dependence on precious gems. 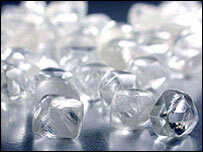 "The wealth from diamonds is not proving to be a panacea". So the catchword in Botswana these days is "diversification", moving into new areas of business. The government is keen to sell itself abroad and demonstrate the benefits of investing here. Textiles, agriculture, tourism, and the financial services sector all offer new opportunities for growth. However, Jay Salkin, an economist at the Botswana Institute for Development Policy Analysis, warns that the country is still facing big challenges. "The economy is diversifying but not rapidly enough," he says. "The non-mining sectors are growing at 5% per annum at present, and while that's quite good by international standards, it's not good enough to absorb the growing labour force, and to move as many people out of poverty as the government is committed to doing." Unlike many African nations, Botswana has successfully kept corruption in check. According to the corruption watchdog, Transparency International, Botswana is the least corrupt country in Africa. The poster on the wall in the arrivals hall at Gaborone Airport is a clear pointer. "Botswana has ZERO tolerance for corruption. It is illegal to offer or ask for a bribe," it reads. Lebang Mpotokwane, chairman of Transparency International in Botswana, says that in a fast-growing economy, there are temptations, but the government has led by example. "The government is forever preaching to the nation about corruption, and I can't think of any corruption involving government ministers," he says. Botswana's diamond wealth has not benefited everyone. This still remains a country with a divide between rich and poor. In Old Naledi, a deprived area on the southern side of Gaborone, the houses are small and overcrowded. Many are without mains water and power. Paul Rantao, an MP for the opposition Botswana National Front, argues that the government has not done enough to address poverty. "The government is more concerned about per capita income, and that doesn't reflect the real quality of life of the majority. Most people here are unemployed," he says. In addition to poverty, there is also a huge HIV/Aids crisis here, hampering development. One in three adults is thought to be HIV positive. It all means that Botswana still falls well short of Mr Blair's vision for a strong and prosperous Africa. 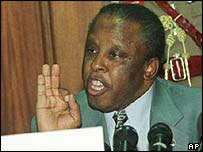 Botswana's President Festus Mogae welcomes the input that Africans have had into the Commission for Africa. However, he wonders how with its focus on debt relief, access to markets and more resources, it can help a middle-income country like Botswana. "We do acknowledge we are no longer the poorest of the poor, and that maybe there are some countries more deserving than others," says President Mogae. "But we don't accept that we should be totally excluded, as is the case at present."